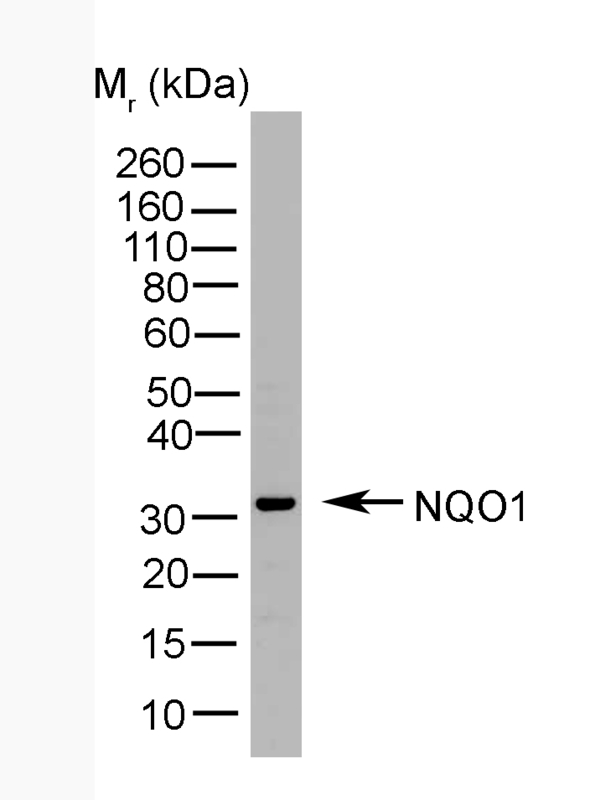 Mouse anti human NQO1 antibody, clone A180 recognizes human NQO1 (NAD(P)H:quinone oxidoreductase 1), a ~31 kDa cytosolic flavoenzyme and member of the NAD(P)H dehydrogenase (quinone) family, involved in detoxification. NQO1 catalyzes the two-electron reduction of quinones to hydroquinones. NQO1 is expressed in a wide range of tissues and is overexpressed in many human tumors including lung, brain, liver, colon and breast. The ability of NQO1 to bioactivate anti-tumor quinones including mitomycin C and diaziquone, has become a focus area for chemotherapeutic studies. Mutations in the NQO1 gene are associated with an increased risk of certain cancers, and an increased risk of leukaemia has been associated with diminished NQO1 activity and the NQO1 *2 allele (Nerbert et al. 2002). 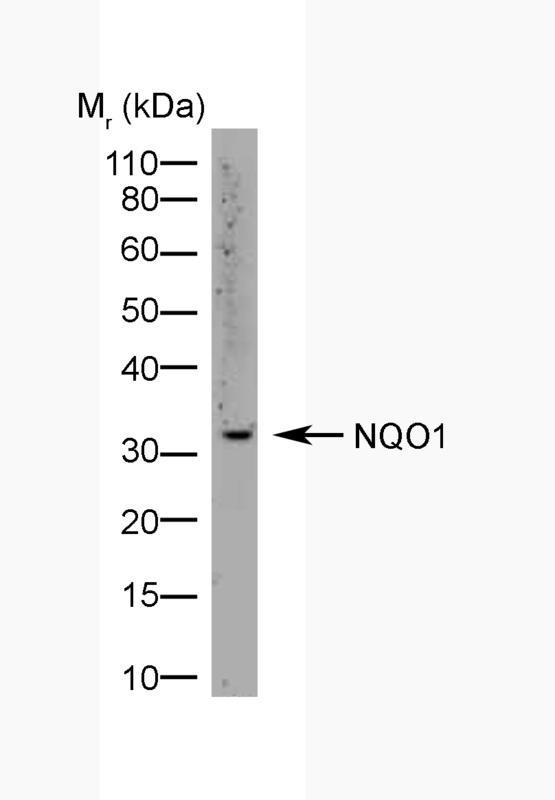 Mouse anti human NQO1 antibody, clone A180 recognizes the product of the wild-type allele NQO1*1 but does not recognize the product of the mutant NQO1*2 allele (Sato et al. 2010 and Fegerholm et al. 2008). Mouse anti human NQO1 antibody, clone A180 detects endogenous levels of total NQO1, and does not cross-react with NQO2 (Siegal et al. 1998). Mouse anti human NQO1 antibody, clone A180 is reported as suitable for use in immunofluorescence studies (Siegal et al. 2012). MCA2880GA detects a band of approximately 31kDa in HeLa and HepG2 cell lysates. Siegel, D. et al. (1998) Immunohistochemical detection of NAD(P)H:quinone oxidoreductase in human lung and lung tumors. Clin Cancer Res. 4 (9): 2065-70. Anwar, A. et al. (2002) Interaction of the molecular chaperone Hsp70 with human NAD(P)H:quinone oxidoreductase 1. J Biol Chem. 277 (16): 14060-7. Anwar, A. et al. (2003) Interaction of human NAD(P)H:quinone oxidoreductase 1 (NQO1) with the tumor suppressor protein p53 in cells and cell-free systems. J Biol Chem. 278: 10368-73. Moran, J.L. et al. (1999) A potential mechanism underlying the increased susceptibility of individuals with a polymorphism in NAD(P)H:quinone oxidoreductase 1 (NQO1) to benzene toxicity. Proc Natl Acad Sci U S A. 96: 8150-5. Zhou, H. et al. (2010) NAD(P)H:quinone oxidoreductase 1-compromised human bone marrow endothelial cells exhibit decreased adhesion molecule expression and CD34+ hematopoietic cell adhesion. J Pharmacol Exp Ther. 334: 260-8. Kansanen, E. et al. (2009) Nrf2-dependent and -independent responses to nitro-fatty acids in human endothelial cells: identification of heat shock response as the major pathway activated by nitro-oleic acid. J Biol Chem. 284: 33233-41.